656 pages | 16 Color Illus. | 133 B/W Illus. Nanocomposites present outstanding mechanical properties and compatibility owing to their composite matrix and unique physical and chemical composition provided by large surface-area-to-volume ratios and high interfacial reactivity. Freedom to functionalize nanocomposites with various chemical groups increases their affinity toward target pollutants, which is highly desirable for the selective extraction of target analytes in complex environmental matrixes. 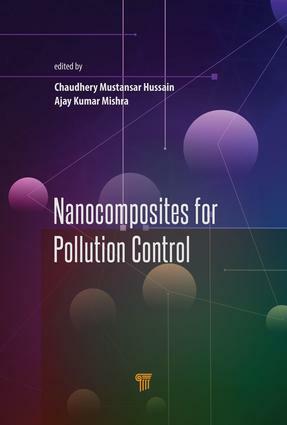 This book presents the recent progress in the field of nanocomposites and their properties, fabrication methods, and applications for pollution control and sensing. It discusses the advances in pollution control techniques made possible because of nanocomposites and focuses on environment-friendly and efficient approaches. The text also covers economic, toxicological, and regulatory issues and research trends. Chaudhery Mustansar Hussain is an adjunct professor, an academic advisor, and director of laboratories in the Department of Chemistry and Environmental Sciences at the New Jersey Institute of Technology, USA. His research is focused on the applications of nanotechnology and advanced materials in environmental protection, analytical chemistry, and various industrial sectors. Dr. Hussain has published numerous papers in peer-reviewed journals and authored or edited several scientific monographs and handbooks in his research areas. Ajay Kumar Mishra is full professor at the University of South Africa and adjunct professor at Jiangsu University, China. His interests include nanomaterials and water research. Prof. Mishra has edited several books and is on the advisory boards of a number of international scientific societies, conferences, and workshops. He has served as an associate editor and is on the editorial boards of several peer-reviewed international journals.